Hey guys! Today’s post is a mini boots haul. I only got two things because as you already might know from reading my July beauty wishlist I am going to study in France for four months so I’m saving up most of my money for that, but also in that post I said that I would treat myself to at least one of those items before I left for France. 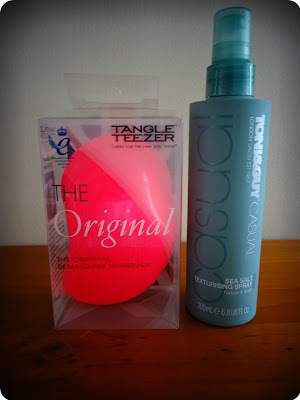 The two items that I got were The Original Tangle Teezer and the Tony & Guy Casual Sea Salt Texturising Spray. I decided to get these two items instead of some of the others in my July beauty wishlist because I needed some new hair stuff to bring with me to France and thought I might as well splurge a little a get the things that I’ve been wanting for a while. I got the Tony & Guy Sea Salt Texturising Spray for €8.99. I haven’t tried it out yet but I’ll make sure to do a review of it once I do. It is suppose to add a lot more texture to your hair and make it look less flat and limp so I looking forward to seeing how my hair turns out. Hope you liked this post 🙂 Have you got either of these products? What do you think of them? Leave a comment below.